An 18th century villa recently restored to a high standard yet keeping all the original features – mixing faded red brick with original stone externally; beautiful beamed ceilings, terra cotta floors & travertine marble bathrooms internally. Sunny, bright, airy & spacious, the interiors are finished perfectly with an eye to comfort & designed with Italian influence. 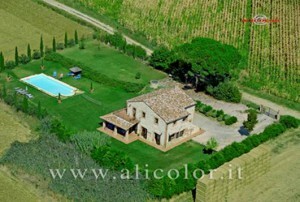 Casa Alessandra is located in San Fatucchio on Italy’s Tuscan-Umbria border. The property sits between Castiglione del Lago on Lake Trasimeno and the Etruscan town of Cortona. It can be rented on a weekly basis throughout the year and is fully equipped. This website will provide you with details about the house as well as information on rates and location. Please take a look at the photogallery and feel free to contact me! © 2015 Casa Alessandra. Proudly powered by WordPress. Please visit the Facebook page of Casa Alessandra!